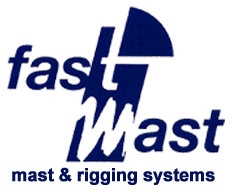 "FastMast, S.L." is an innovative company that offers global solutions in the sailing sector, including manufacture, transport and assembly of rigs. The fact that we take care of the entire process, confers us both flexibility to move within the EC, and high effectiveness in termes of delivery times. The products we offer include: alluminium and carbon fibre masts and spinnaker poles, cable and rod rigging, running rigging, deck hardware, sails, ... On the other hand, we profit from our professional expertise and the quality of the raw material for applications in construction such as rails, canpoy supports, marquees and structures.